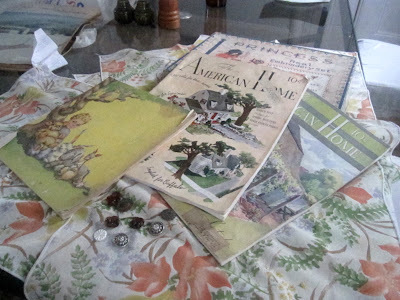 A sunny March Saturday, a friendly antiques dealer, a stack of vintage napkins, and all is well with the world. I hadn't been out rummaging in my usual haunts for awhile (the winter doldrums?). It was so refreshing to get back out and spend some time poking around for treasures. The napkins are great, really, but the true gem is the little Princess Embroidery Kit ($3) I found, complete with little pattern-printed handkerchiefs, floss, and a miniature packet of needles. All the more charming are the snaggledy rows of cross-stitches some little hands worked on one of the hankies. So sweet! I also found an old childrens' book, from 1934. Do you recognize the cast of characters? It's a Winnie-the-Pooh book, pre-Disneyfication, when Winnie was really just a stiff and very much inanimate teddy bear, and Christopher Robin looked something like Chucky. A dour little boy indeed. My general relationship with antiques stores is rather fickle. Some I love, some I loathe. Too often so-called "antiques stores" are really just shelf upon shelf filled with clutter: chipped dishes, Happy Meal toys from ten years ago, the denizens of figurines dredged from the homes of a hundred little old ladies. You know the kind. I always walk out of those places thinking, I have enough of my own junk as it is, why would I want to buy someone else's? Almost as often, antiques stores are preceded by a cultivated sophistication, an air of haughty superiority. There will be lovingly polished mahogany spindles, the soft glow of authentic Tiffany lamps. Sinatra or Martin, Fitzgerald or Holiday will tinkle from a genuine Zenith radio, circa 1938. This is what happens in the towns where fat-walleted yuppies like to take their vacations. Fortunately, Binghamton is not such a town. On Clinton Street, so-called Antiques Row, there are the sort of sweet, dusty little shops I love. I don't mind the crackle of an AM station in the background, or the nutty banter of the shopkeep. I'm partial to old linens, curiosities, and buckets of old hardware kicking around on the floor. I've found some great old buttons in the bottoms of dusty boxes. It's the thrill of the hunt, and I'm happy as long as there's something worth hunting for. That's my thrifting/antiquing manifesto. What's yours? Great finds! I also have a love/hate relationship with antique places. You're very right on the choices. Congrats! I feel the same way you do. I like a shop that's not too stodgy and not too dumpy. Any shop with vintage linens priced for bargain hunters like me is my kind of shop. Vintage linens are the best! They're one thing I have a hard time finding around here... but I'm always on the lookout. I live near San Anselmo, CA which is infamous for its tree-lined street of antique stores. I am in heaven, basically. My treasures are often called "junk" by my boyfriend but I stand by them. Antique wood and pine pieces like little desks and stools are my faves.